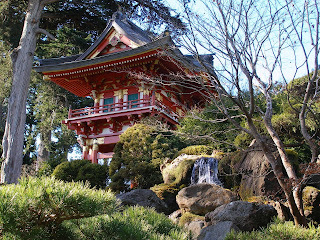 The Japanese Tea Garden in Golden Gate Park was originally developed for the 1894 World's Fair in San Francisco. It is a tourist must, as evidenced by the number of tourists who go. 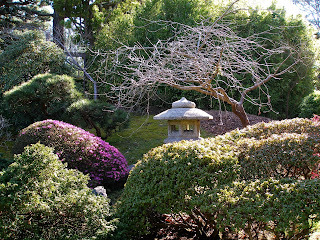 However, there are peaceful areas of the garden (such as the Zen garden) and the landscape is definitely worth the time. You can also relax and partake of the tea (or other refreshments) and cookies or crackers (I like the little sesame crackers) at the tea house. 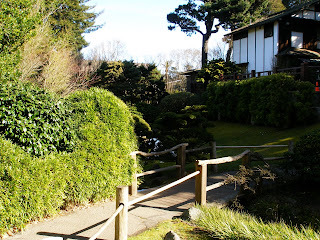 The tea house is a nice break if you have been checking out some of the other activities in Golden Gate Park. 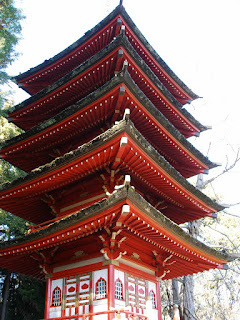 Admission is charged to the Japanese Tea Gardens. They also have a gift shop filled with your typical touristy knick knacks. 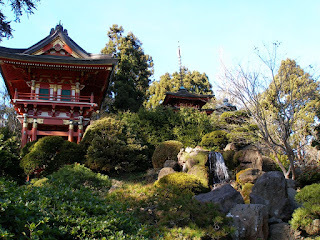 The gardens have several structures and bridges, adding interest to the landscape of flowers, trees and shrubs, and water features. One of the most interesting bridges is the drum bridge (pictured below from the top down view). 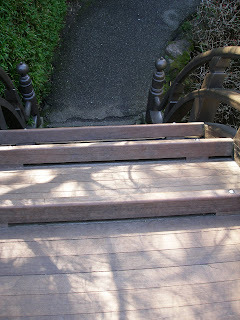 This bridge is a has a sharp arc and vertical ascent and descent. It is a little scary, but more some on the downside than the climb up.